Here's an article in Italian today on an Italian course on TV for the Chinese community in the city of Prato called Ripeti con me (Repeat with me). 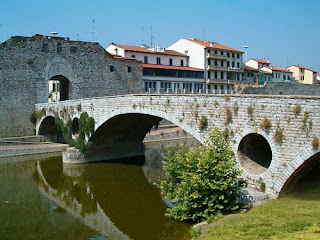 Prato has a population of almost 200,000 and is just 20 km from Florence. "Ripeti con me" is the title of a new broadcast in Prato, one that TV Prato has decided to produce in order to aid the learning of Italian for Chinese citizens in the city. This is the first time that a didactic TV program has been produced for a specific community (comment: really? Never once before? Take this with a grain of salt)...the program will begin on the 8th of March. The program's objective is not just to teach Italian but also to help with familiarizing the Chinese community in the city with "a society as diverse as ours and with situations that one is confronted with today." Each episode will end with two proverbs (Proverbi a confronto), one in Chinese and one in Italian, in order to show that the two cultures are certainly diverse but with interesting points in common. Edit: found a video on YouTube previewing the show.